zdjęcie pochodzi z Gazety Wyborczej. Mieszka na Manhattanie. Był profesorem zoologii na New York University. Jest także specjalistą od zjawisk nadprzyrodzonych w Nowym Jorku. So what is it like to be pronounced the oldest man on earth? 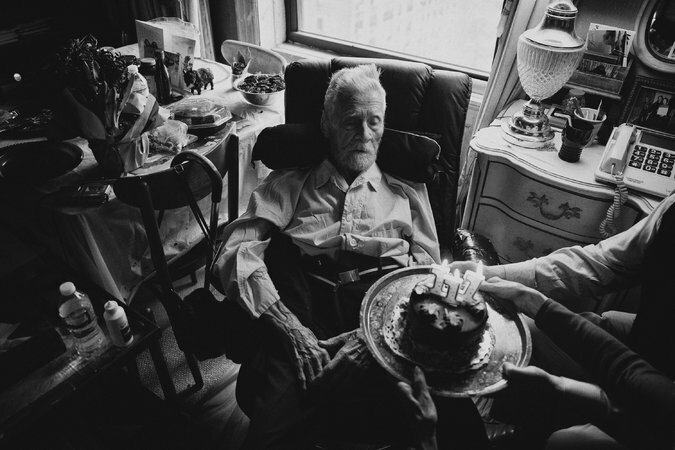 Alexander Imich, 111 ¼ years old, sat in a chair in his Upper West Side apartment overlooking the Hudson and made a face. Stick-thin with vein-roped hands, bristly whiskers and an enviable shock of hair, he formed a gaunt smile, eyes dancing. “Not like it’s the Nobel Prize,” he wheezed, pausing for a startled moment when his hearing aid popped out. Yes, Mr. Imich, a scholar of the occult who was born in Poland on Feb. 4, 1903, is the world’s oldest validated male supercentenarian (those over 110), according to the Gerontology Research Group of Torrance, Calif.
Mr. Imich was 10 months old when the Wright brothers invented machine-powered manned flight. Teddy Roosevelt, having assumed the White House upon the assassination of William McKinley, had yet to run for the presidency on his own. Mr. Imich remembers the first automobile in his hometown, fighting the Bolsheviks in the Polish-Soviet War, escaping the Holocaust and surviving a Soviet gulag. He then immigrated to the United States, finding time to master the computer and publish a book on the paranormal at 92. He grew up in a well-to-do family of secular Jews in Czestochowa in southern Poland, known for its famous painting of the Black Madonna. His father, who owned a decorating business, installed an airstrip for early aviators. “At the time, flying was a demonstration,” he recalled. “It attracted people for the show.” He called “the aeroplane” the greatest invention of his lifetime. He sought to become a captain in the Polish Navy, but as a Jew was told to forget it. “I decided to become a zoologist and traveled to exotic countries in Africa,” Mr. Imich recalled. But blocked from advancement, he switched to chemistry, earning a doctorate at Jagiellonian University in Krakow. In the early 1930s, Mr. Imich grew fascinated with a Polish medium who was known as Matylda S., a doctor’s widow gaining renown for séances that reportedly called up the dead. He participated in numerous inexplicable encounters that he detailed in a German scholarly journal in 1932 and recounted in an anthology he edited, “Incredible Tales of the Paranormal,” published by Bramble Books in 1995. He keeps a box of forks and spoons twisted in macropsychokinesis experiments. “I watched ordinary people doing that,” he said, although he himself was unable to duplicate it. He married a childhood sweetheart who a few years later left him for another man, whereupon he married her friend, Wela. When the Nazis overran Poland in 1939, they fled east to Soviet-occupied Bialystok. Refusing to accept Soviet nationality, they were shipped to a labor camp. With Russia reeling under German attack, they were freed and moved to Samarkand, a city in Central Asia, in what is now Uzbekistan, and then back to Poland. There they found that many family members had died in the Holocaust. In 1951 they immigrated to Waterbury, Conn. Wela Imich, a painter and psychotherapist, opened a practice in Manhattan. After she died in 1986, Mr. Imich moved into her suite in a prewar apartment hotel at 305 West End Avenue. Eight years later it was turned into the Esplanade, a luxury senior residence, and he was grandfathered in. His savings vanished in dubious investments, and The New York Times Neediest Cases campaign came to his aid in 2007. So what are his secrets of longevity? He used to smoke but gave it up long ago. He always ate sparingly, inspired by Eastern mystics who disdain food. “There are some people in India who do not eat,” he said admiringly. Now, his home-care aides said, he fancies matzo balls, gefilte fish, chicken noodle soup, Ritz crackers, scrambled eggs, chocolate and ice cream. At the words “ice cream,” Mr. Imich perked up. “Jah!” he interjected. The couple who came to visit, Michael Mannion and Trish Corbett, founders of the Mindshift Institute, dedicated to spreading new scientific knowledge of the nature of the universe, met Mr. Imich in the 1990s at the IM School of Healing Arts on 26th Street in Manhattan, where, though he was already in his 90s, he prepaid for three years.